It’s time for our 3rd Annual Run / Walk for Research! The American Hand Therapy Foundation is the ONLY organization solely dedicated to supporting hand therapy research and education by funding grants. Please join us in this fun event or donate to support the evidence behind hand therapy practice. Your participation helps to directly fund the Foundation Grants.! 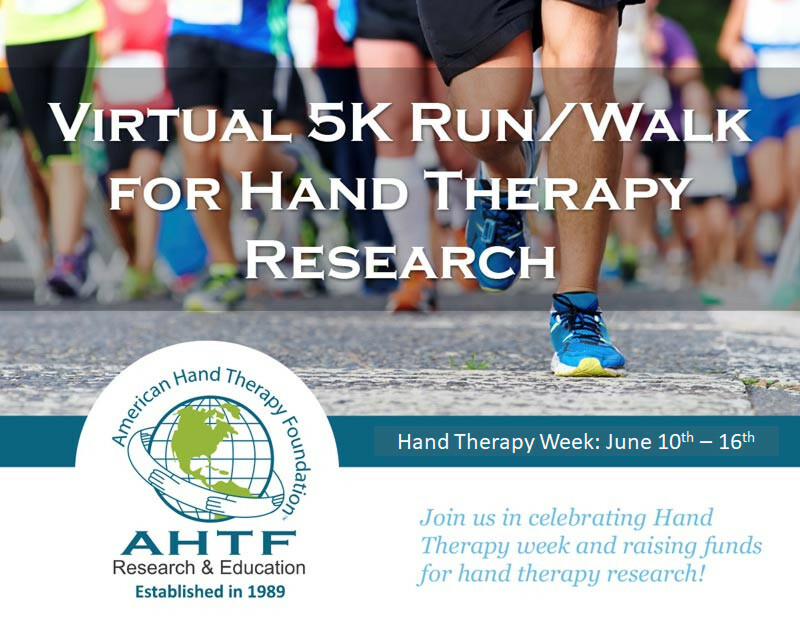 Complete a 5K run or walk before the end of Hand Therapy Week, June 10, to promote AHTF and hand therapy research. Participate in a walk or run at your own pace and location of your choosing! Invite your colleagues, friends and family to join in this fun and meaningful event. Share your achievement! Post a photo to our Facebook page! Registration fee is $35 per participant (plus $2.79 credit card handling), but we also invite you to have others “sponsor” your participation. To register, please click here! TEAM registration (2 or more) is $30 per person. Groups / organizations with the highest fundraising achieved will be featured on our website throughout the year! To register your team, please click here! We will not be virtually monitoring your time, but feel free to boast! Donors or sponsors – For registration, please click here! Then click the green “register” button at the top and then “individual”. You will then see a separate donor/ sponsor area. Thank you to the following companies for their support of the 2018 AHTF Run for Research!